Not all cycle races or rides are created equal but some stand out because they are more than just another race or ride. Not only do they offer extra drama (OK, chaos) but also add something different. I am drawn to races and rides that are in this camp. I like track cycling but it’s mostly played out in a controlled environment and many modern road races are more a marketing tool held on wide often featureless terrain, than a fight against the elements and fellow competitors. Therefore it’s no wonder that I am attracted to cyclo-cross and road races such as Paris Roubaix, Dwars Door Het Hageland, Slag om Norg, SCHAAL SELS Merksem, Strade Bianchi, Dengie Tour of the Marshes and Tro Bro Léon. For me it’s the sun on your neck, the wind in your face or the rain seeping inside your collar (if in the mood) that I savour whether it be my own ride or a race to watch. 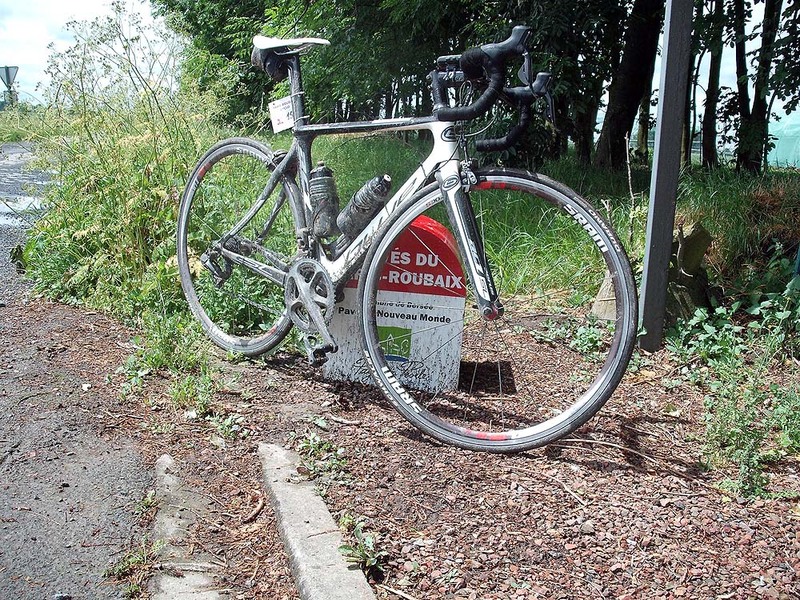 Purists, especially those of the road find races such as Dwars Door Het Hageland and Tro Bro Léon a daft novelty, but the quick canonisation into ‘classic’ status of the Strade Bianchi or the ever increasing popularity of Paris Roubaix as a spectacle shows a hunger for more than simple tarmac can provide. I would never underestimate the standing of a mountain stage or race, but not everywhere can boast a hallowed or feared Alp in their district. I also appreciate the tactics and effort needed to be deployed in any race to win it. On Vauxhall beach, yes it’s the seaside as far as Teddington Lock I believe. 28 Challenge Roubaix’s feature on my summer cross bike. I began mountain bike trail riding in the 1990’s and I can recall getting lost in the wild and then ‘Sherlock Holmes’ style (The Adventure of the Priory School) I found my way by first identifying our tyre treads and then seeking them out tracker style in the mud. At that time, I hadn’t stopped riding my road bike (Merckx 7/11) but I found the seeking out off road routes exciting and rewarding. My swing toward the rough stuff happened when I realised I could combine elements of a road with those of a MTB ride. The Rough Stuff Fellowship (http://www.rsf.org.uk/) had been doing it for decades and in those pre-internet days their newsletter was fun to read, if a wee bit prosaic at that time. Nonetheless inspired, I fitted a pair of skinny Ritchey 1.7s (in red) onto my mountain bike. 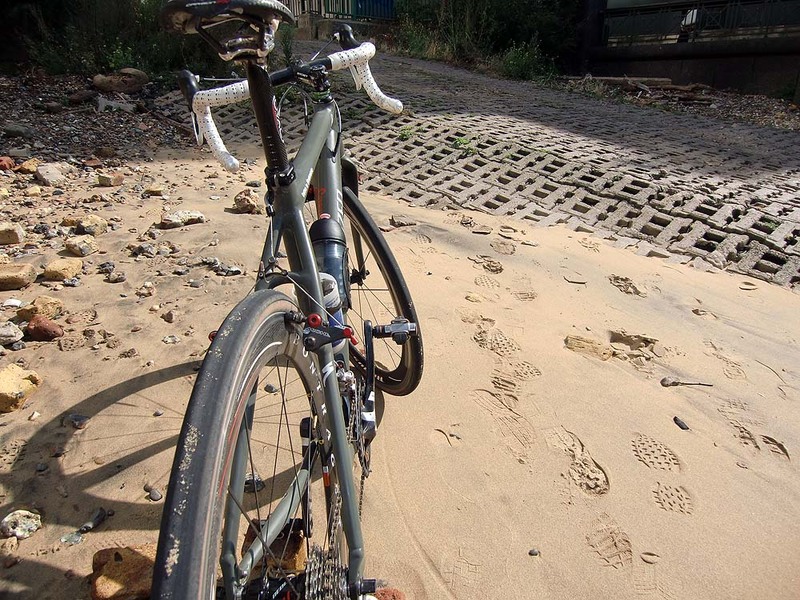 It would seem that I am not alone in liking a ‘ride on the wild side’ as more and more organised ‘gravel/cross’ sportives and races are emerging to help prove my case. A small pleasure close to home. 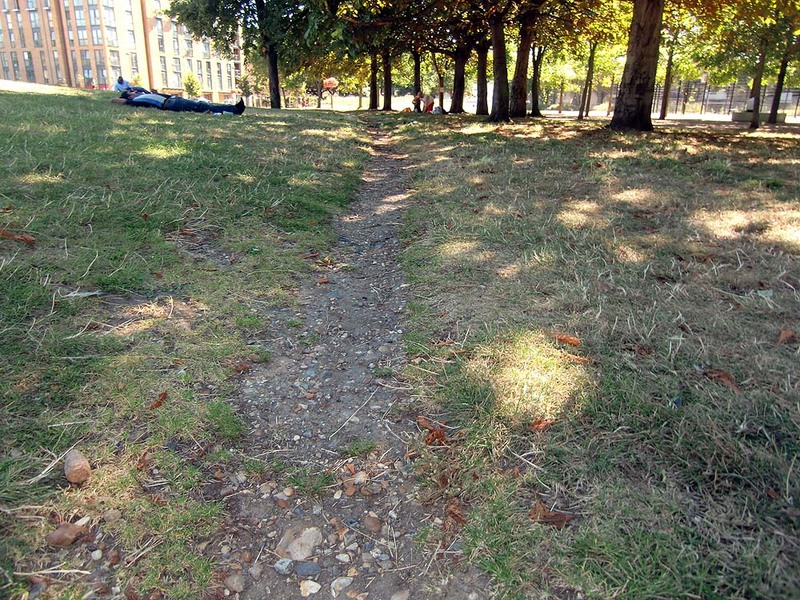 Living in London and having a busy schedule I investigated the many tow paths, public open spaces, bridleways and other legal tracks that can be linked together to make a good ride. I remember reading a great feature in a German cycling magazine that outlined a similar theme in Berlin and five other cities, and this spurred me on. Being able to get a good ride done in limited time can be a necessity and it should be a ride that can be tailored to suit, that also allows you to add or miss a section if time dictates or even find new routes that you can turn into your own ‘Paris Roubaix locale’. I have been able to find a few metres here or there of local ‘odd stuff’ which when put together can add great value to a ride. Recently when recovering from surgery I did a four kilometre route directly from my front door that featured cobbles, off road trails, a hill (of sorts) and quiet, but still challenging roads and this did wonders for my morale and began my ride back to some sort of normal. I live near the Thames in Central London and this naturally became my starting point; being domiciled in the south I ventured onto the river path at Putney and rode to Hampton Court and then back again. With plenty of trips under my belt I began to explore ways to create better round trips and I sought out ‘urbanside’ roads (most of Belgium seems thus) – urban roads that are less used by through traffic, have a feel of the country about them and are not too well maintained or at least have a few cobbles (or potholes). One such is Wilcox Rd near Vauxhall (also known for being the setting for the film ‘My Beautiful Launderette’) which has a short section of cobbles and a right hand turn that leads onto a set of streets that then continues up a climb and onto Clapham Common, one of the green stepping-stones in my journey. Real pave and at times very tricky. From this I and others created our own ‘Three Pimples’ ride in homage to the ‘Three Peaks’ Cyclo Cross race that takes place in the very serious Yorkshire Dales, but ours is much more ‘softy southernish’. Turn left and onto an old abandoned road. 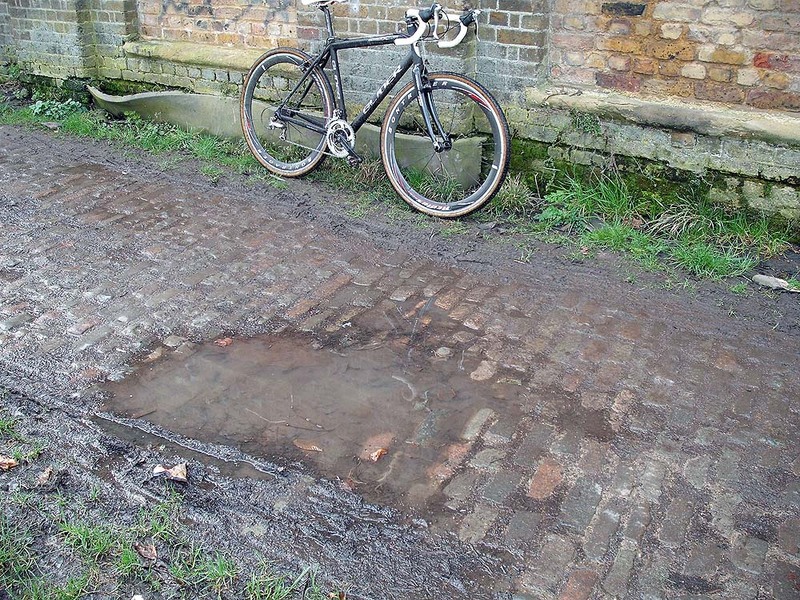 My cyclo cross and ‘Roubaixesque’ routes or should I say ‘gravel’ rides (in modern parlance), whether inside the city or into the countryside must allow me to dream, i.e. play out Paris Roubaix in my mind and thus the terrain must offer the chance of meeting the unexpected. An element of unpredictability makes you engage, a route that will test you more than just being able to steer, and when it rains, snows or the wind blows it makes the humblest of rides into a semi-classic or at least a minor adventure. Although I have never really bought into the notion that cycling is about suffering and the enjoyment thereof, I do recognise that mud in your face and rain streaming down your neck does bring out something deep from within yourself. Of course I am very happy to ride on a hot or clement day and have to wipe dust and sweat from my face instead. The point is when you look up the trail you can set your mind to work and something just clicks beyond the simple enjoyment of riding. This adds value and balances out the fact that you are not in some great spot on a ‘proper’ ride. The joy of finding such routes in the city is that you can get out to ride more often, finding small pleasures where there is less motor traffic (but watch out for pedestrians and most notably dog walkers or those living within their own headphone cocoon) and you get to see so much more of your area. 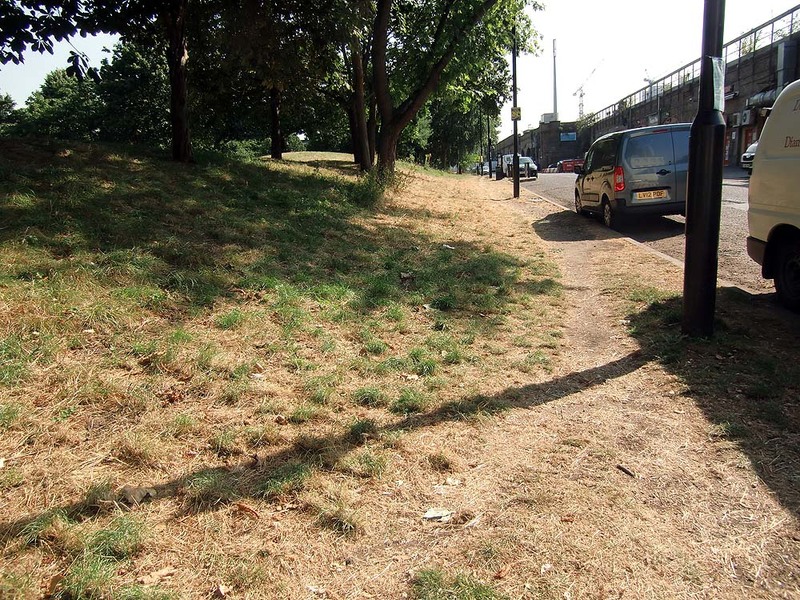 We have to share the paths so be calm out there; if a walker gets in the way pretend they are a fan getting too close, (Just don’t thump them as did Christopher Froome in the Tour) rather slow and then attack the path when clear. It’s all just part of the ride. Everything that slows you or gets in the way is ‘in play’ and you treat it as you would any obstacle – with respect. I have ridden a MTB on my London routes but only a few times (because that would be cheating), a road bike many, many times and of course my cross bikes, one for the winter and the other for the summer. 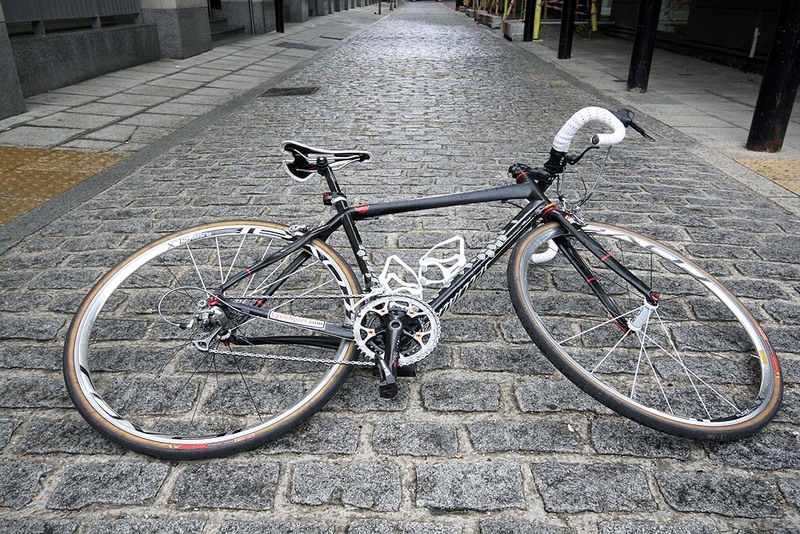 Almost all my routes within London can be ridden on a road bike complete with a pair of pave tyres (Challenge 28 Roubaix’s or Vittoria Paves 25 or 28’s) although in the winter a cross bike wins hands down. These are a few routes travelled by me. 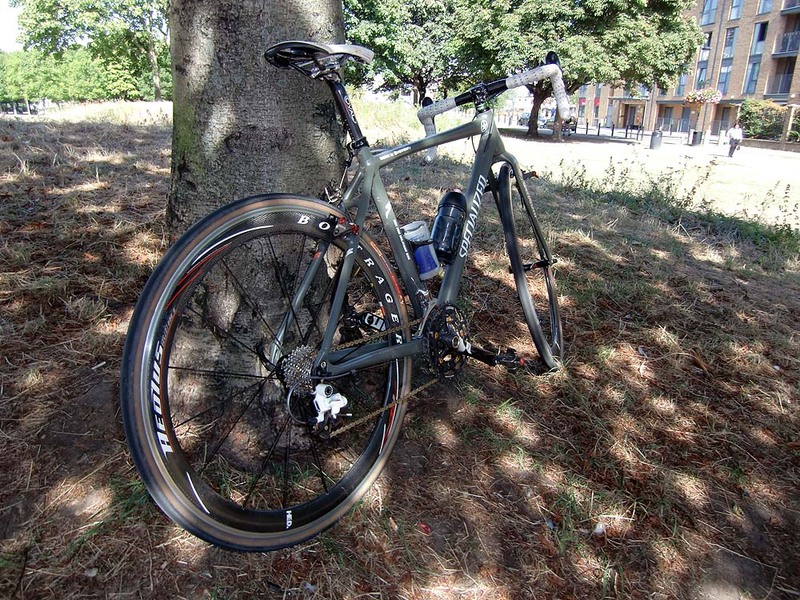 A quick mid-week ride and similar to the Thames River ride, but starting with Clapham and Wimbledon Commons, Richmond Par, onto the river path at Kingston and back to Richmond via the steep climb of Nightingale Lane at Petersham and then whence we came. Four good climbs give this ride a little edge. 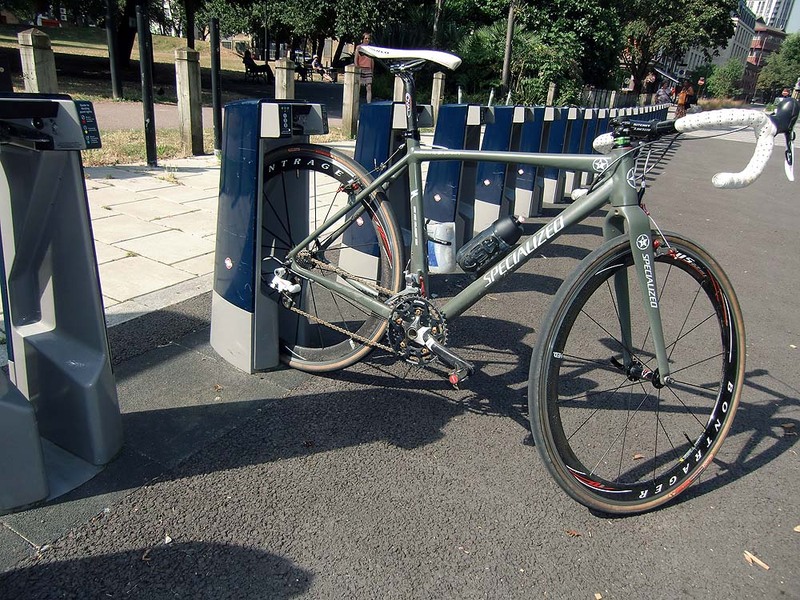 A circular cyclo cross ride of 50km’s including the Thames River, Richmond Pk, Wimbledon Common and back to central London via Clapham Common. 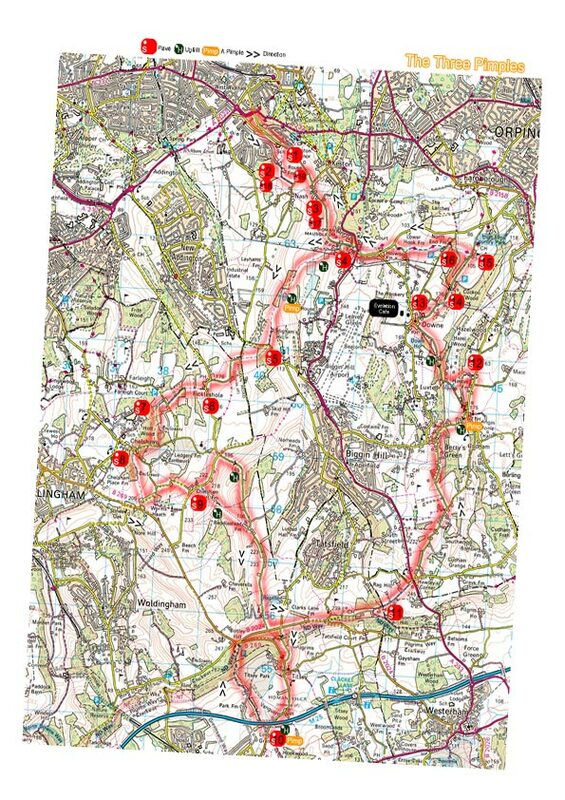 We used to ride this in preparation for the Three Peaks, now it’s a cyclo cross training/social ride out onto the North Downs featuring road and off road sections. If you were going to ride the northern classic you also included the descent and then back up the off road Titsey Hill, whilst the rest sat and talked about flora and fauna, as you do. 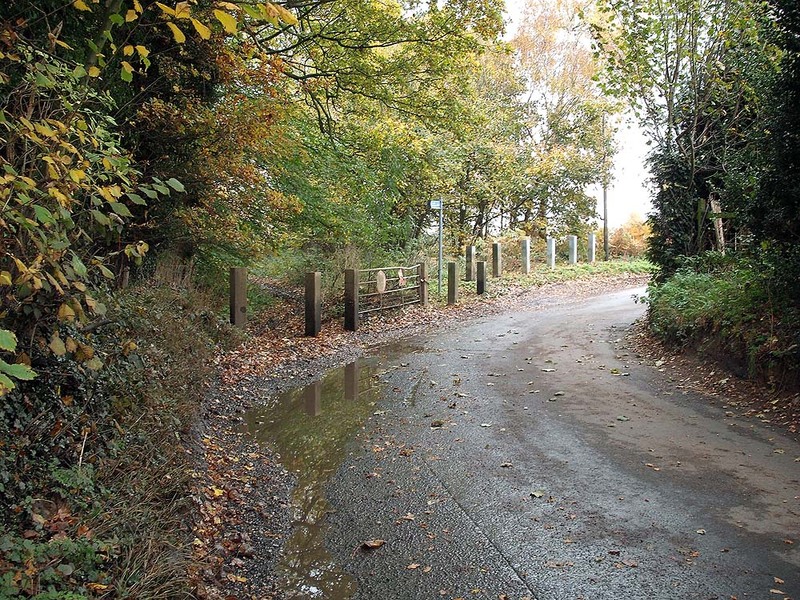 A road bike ride that passes by the Telegraph Pub at Wimbledon Common and misses out the worst at the bottom, by the river near the A3..
2017 Slag om Norg ‘road’ race – The ‘Slag om Norg’ ‘road’ race and the 190km route comprises 30km of gravel held in the Netherlands.